Competition shooting drills measure both how quickly and how accurately the shooter can complete the task. Rob Leatham has set up a competition transitioning drill with both one paper and three steel targets. The drill consists of a total of seven shots. Whoever shoots fastest and most accurately will have the best score, as in other competition shooting drills. This drill requires the shooter to first hit the steel target once, then hit the paper target twice, next hit the second steel target for one shot, back to the paper for two shots, then the third steel target for one final shot. 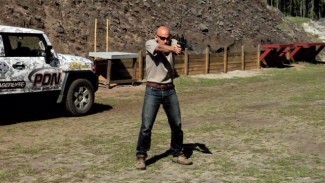 Rob Leatham lets defensive shooting and handgun training instructor Rob Pincus define the value of accuracy on the targets in this drill. Rob Pincus decides it should be any hit in the C zone — which would be a solid hit in a defensive shooting. And it’s a failure if any shot is outside the C zone. Rob Pincus makes all the hits in a time of 5.05 seconds. Rob Leatham then shoots the drill in 3.33 seconds. Why can Rob L shoot the drill so much faster? They conclude it is because Rob L does not doubt at any point that he is going to make every shot. He shoots this and all competition shooting drills with the mindset that he is never going to miss a target. 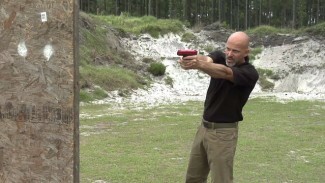 He expands on this by explaining that one of the techniques he uses when doing firearms training with students is to instill in them the idea that they know the result of the shot before they have fired it. 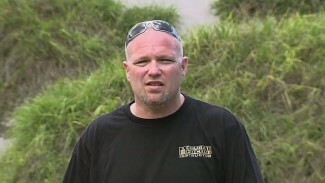 Rob does not come back to see if he hit the target, or stay to see if he hit it. That’s the competition mindset at work. In a gunfight, it doesn’t work that way. But in competition, there is no assessment. 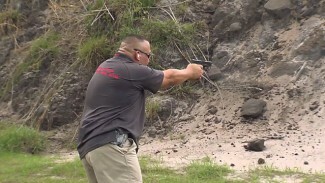 And that makes a big difference in how competitors and defensive shooters approach drills, and in the results they get. Man, I wish I had a range nearby where I could do a drill like that… Fun AND helpful!